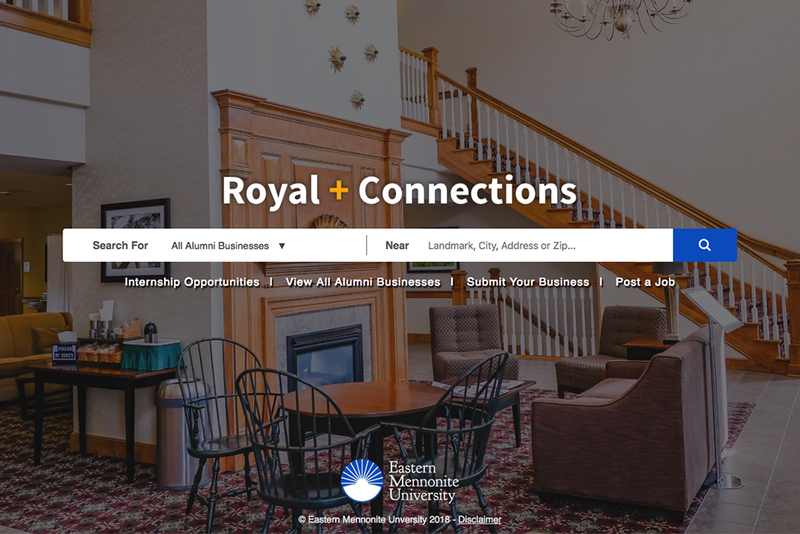 Royal Connections, a new feature launching on Eastern Mennonite University’s website, showcases alumni-owned or managed businesses all over the world – and helps students, parents and graduates find and connect with them. Do you live in Bellefontaine, Ohio, and want a doctor who loves EMU as much as you do? No problem. Advertising services in Salem, Oregon? Check. A restorative justice program in South Korea? Um-hmmm. Barbecue in Souderton, Pennsylvania? Yep – that, too. Alumni business owners, submit your information here. Searchable by business category, internship opportunities and region, Royal Connections is already populated with more than 125 businesses – well over the launch goal. The site also links users to EMU’s career services website, where business owners can recruit Royals. Developed by EMU’s web developer and analyst Joshua Lyons with input from Shank, the site integrates various Google Map features. Users can see all of the businesses at once on the map or search by region, business type, or internship possibility – or just use the map to zoom in or out on an area to see what’s nearby. Shank came up with the idea after a casual conversation with Mitch Troyer ‘93, vice president of Blue Ridge Powersports in Harrisonburg, about connecting alumni to each others’ businesses. Several alumni-owned businesses that have sponsored the site are featured in rotation on the site homepage: Emotional Health Center in Lancaster, Pennsylvania, co-owned by Doug Friesen ’91; Peace, Love, and Little Donuts in Harrisonburg, co-owned by Katelyn Troyer ’14; the Valley Roots Team, with Jeremy Litwiller ’97 and Derik Trissel ’01 of Kline May Realty in Harrisonburg; and Best Western Plus Dutch Haus Inn and Suites in Columbiana, Ohio, co-owned by Grace Witmer Styer ’79 and Nelson Witmer ’87.